Adding a kitchen island with breakfast bar can help improve the efficiency and charm of your cooking and dining space. Although it can be a big job, it can also be a creative and ingenious way to give you more useful space and create a friendly spot for your family to gather. When contemplating kitchen design updates, space is a big consideration. Kitchen islands need clearance on all sides of from 42 to 48 inches. Flow is an important factor too. If your kitchen is designed with work areas on opposite walls, placing an island between them will only add an obstruction, like sticking a flower planter in the middle of the driveway. The best areas for an addition are close to the sink, refrigerator and stove, but out of the most direct paths you usually take to get around to the different workstations in the room. There is some other spacing you should keep in mind too. Each person eating at the breakfast bar will need 24 inches of space side-to-side with a 12-inch depth. 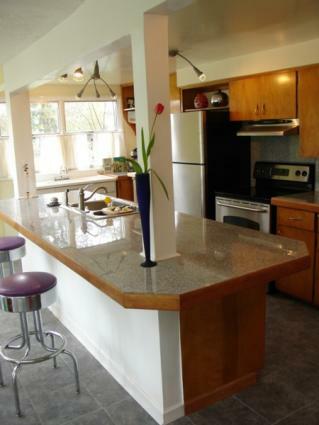 For this reason, the minimum size of a kitchen island with breakfast bar is three feet by five feet. (3' x 5'). Take the cabinets, refrigerator, dishwasher and oven into consideration too. Measure the space with the doors open, and make sure you have enough clearance for people to move around comfortably. Once you know you have the space, take some time considering how you're going to integrate the island into the rest of your décor. Selecting neutral colors and matching materials will help insure that your addition has a finished look. For most of us, kitchens are work areas, so creating and maintaining an efficient working triangle is important. In new construction, you can plan with the contractor to design an efficient space. For retrofit projects, you'll probably be dealing with some limitations. One of the biggest limitations is space. Kitchen square footage is prime real estate in your home, and as with other real estate, location is important. You will want to situate your kitchen island and breakfast bar close enough to the useful areas of the kitchen to be convenient to use, but not so close that it gets in the way. If it's too far away, no one will use it. If it's too close, obstructs electrical outlets, or makes it difficult to open doors, it will be more of a problem than it's worth. One option for kitchens with limited space is to construct a portable kitchen island mounted on locking casters. This type of setup can share quarters with, say, a small table, and be moved when the table is expanded for guests. Another consideration is an island with hinged sections that can be dropped down flush with the sides of the unit when not in use. When putting together your wish list, don't forget storage. Units with built in shelves or drawers can be very useful, and once in place, can work with other elements, like pot racks, or wall shelving, to provide additional storage and create a finished look. From spacious and impressive islands, to cozy portable affairs that can offer flexibility, there are lots of options to choose from when contemplating a kitchen island addition. For the do it yourselfer, there are even free plans online that can help you. When contemplating larger projects involving electrical or plumbing, consult a licensed contractor. If you have to modify the electrical, plumbing, or ductwork in your kitchen, it could be a big job that will need to be completed according to the building codes in your area. Another easy, inexpensive option is to rehabilitate an existing piece of furniture for use as a kitchen island and breakfast area. A thrift store find, like an old chest, buffet or desk, can be the basis for a unique and one-of-a-kind look. With a little ingenuity, anything is possible.